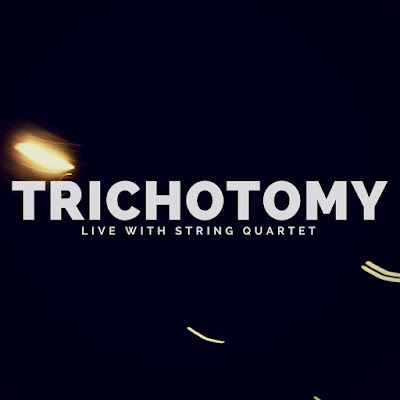 Trichotomy are an Australian trio formed in 1999 while studying at the Conservatorium in Queensland. Their format is standard – piano bass and drums – but their output has always striven to break out of any and all constraints that may restrict the full range of their invention and vision. Working in conjunction with other artists is not a new venture for the trio – they have appeared with chamber groups, a saxophonist, and a symphony orchestra in the past. The hallmark of their output centres around their willingness to place themselves in potentially narrow musical formats, and then thoroughly enjoy confounding them with their inventive approaches to making ground-breaking music. But anyone expecting a serious clash of musical styles when placing a free jazz trio with a quartet of violins, viola and cello will be pleased at the enjoyable musical support and advance that each offers to the other. The opening piece Dancing About Architecture was composed by drummer John Parker and is percussive as you would expect. From the opening notes, it’s clear that the strings are not there to "accompany" the trio – the piece is a fully integrated work with all instruments being given equal space and a platform to contribute to the overall sound. Founder and pianist Sean Foran has the next three pieces on the album. His piano playing ranges from subtle sound washes to spikey progressions which are enhanced by bowed and plucked string work from bassist Samuel Vincent to add to the percussion, ensuring that the listener is always unsure of where the pieces are going to go next. Bookending the album is Life Gets In The Way, another piece by Parker. Once again the percussive feel of the string quartet forms the basis of the music which builds as it progresses, drawing together all the elements that have made the album so enjoyable. Jazz is all about being in the moment, and you can never be more in the moment as a listener than by experiencing the unique nature of a live performance which is never ever going to be the same again. The next best thing is a live album like this one, which is only one small step removed from that live experience, being a soundscape captured on that one evening back in October 2014. If the purpose of any album is to give you repeated listening pleasure, while also inspiring you to check out more of the artists’ work, and find when you can go and enjoy them performing in concert, then this album ticks all those boxes. A first listen leads immediately to a second, to start listening for, and finding, the additional nuances and extra treats that were missed the first time, and the start of some anticipation for when more of this remarkable trio’s work may be released – and when they will be visiting the UK. This album shows that Trichotomy’s desire for innovation and border-blurring music is stronger than ever, and as a live jazz recording, this is about as good as it gets.